Our 7.0 Tesla MRI scanner offers two advantages for preclinical research: the ability to perform in vivo monitoring of a wide range of biological variables non-invasively, and the ability to serially track the progression of a disease or intervention in the same living animal. Good biomarkers that allow assessment of drug candidates have long been recognized as important in reducing the high attrition rates and long development times that pose great financial risk to the pharmaceutical industry. MRI is one modality that is set apart from other biomarkers because the imaging readouts tend to be much more closely related to the disease phenotype, thus facilitating direct associations between therapy and effect. As such, our state-of-the-art MRI scanner, with a recent upgrade in 2013, is equipped with the newest electronic hardware and offers a wide range of cutting-edge MRI techniques for biological and medical applications, e.g. very high spatial resolution anatomical imaging, blood flow and tissue perfusion measurements, myelin water imaging, functional MRI, cell tracking, multi-nuclear spectroscopy, cardiac imaging, and many others. 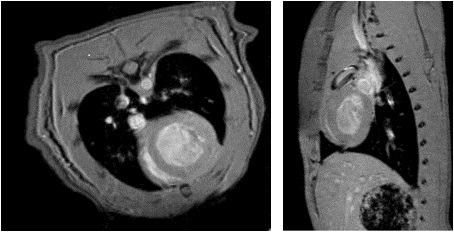 These cutting-edge MRI techniques are invaluable for preclinical assessment of a therapy’s efficacy and mechanism of action. Of particular note, we have a strong academic track record in imaging animal models of cancer and spinal cord injury. Our 3.0 Tesla facility provides high-contrast anatomical images and detailed physiological and biochemical information from human subjects, obtained non-invasively. It is particularly well-suited for the study of human disease processes and also for obtaining better understanding of normal human behaviour. Bruker Biospec 7.0 Tesla MRI Scanner with 4 receiver channels, 20 cm diameter accessible bore size. Morphological imaging: Performs very well in measuring anatomical detail due to excellent image contrast between individual soft tissue types (e.g. water vs. fat, normal vs. cancerous). A voxel size of 0.1 x 0.1 x 0.5mm is achievable through careful experimental design and moderately long acquisition times. Designed specifically for research studies on small experimental animals such as mice and rats. Provides a full range of research support for Magnetic Resonance (MR) imaging and spectroscopy applications including method development, data collection and data analysis. Philips Achieva Intera 3.0 Tesla MR Scanner with high-performance gradients, 16 receiver channels and 60cm bore size. High resolution imaging: Superb anatomical detail due to excellent soft tissue image contrast. Designed for state of the art in vivo research studies on human subjects. Provides a full range of research support for and collaboration with MR imaging and spectroscopy applications including method development, data collection and data analysis. 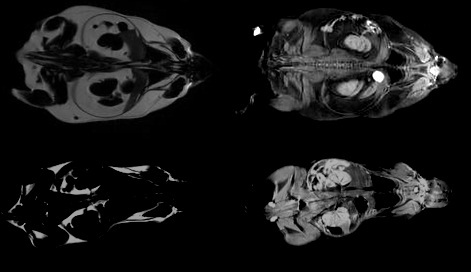 Figure “cardiac MRI”: Respiratory and cardiac triggering allows acquisition of high resolution images of rat myocardium to assess anatomical details (e.g. myocardial wall thickness) or functional parameters (e.g. stroke volume, ejection fraction) from the entire heart at different time points of the cardiac cycle. MRI allows tracking individual cells labeled with iron-oxide particles. In the example shown, labeled and unlabeled human retinal epithelial cells (approximately 10,000 cells per track) were implanted into the rat brain and monitored with MRI over a period of 8 weeks. 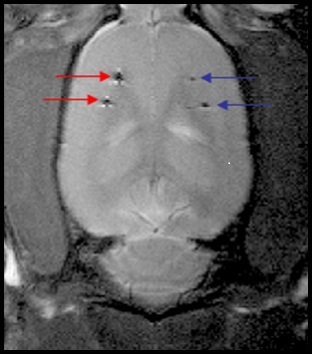 As can be seen on the image, labeled cells (marked by red arrows) can be easily identified by a typical bright halo around them. Blue arrows point to the location of unlabeled cells. 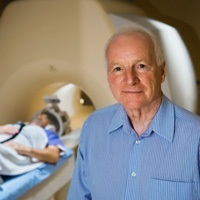 Dynamic Contrast Enhanced MRI (DCE-MRI) technique allows the study of tumour vasculature and its changes following tumour growth and therapeutic intervention. By modeling the DCE-MRI data physiological parameters, e.g. vascular flow or vessel permeability, can be assessed. 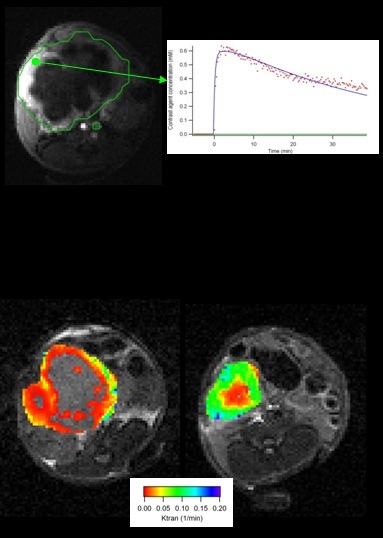 The top figure shows a snapshot of the tumour during contrast enhancement, and the concentration time course within one pixel. The resultant volume transfer coefficient (Ktrans) is shown for a tumour treated with a maximum tolerated dose regimen (left) and a metronomic dosing regimen (right). Figure “White Matter nerve fibre tracts revealed by diffusion tensor imaging”. 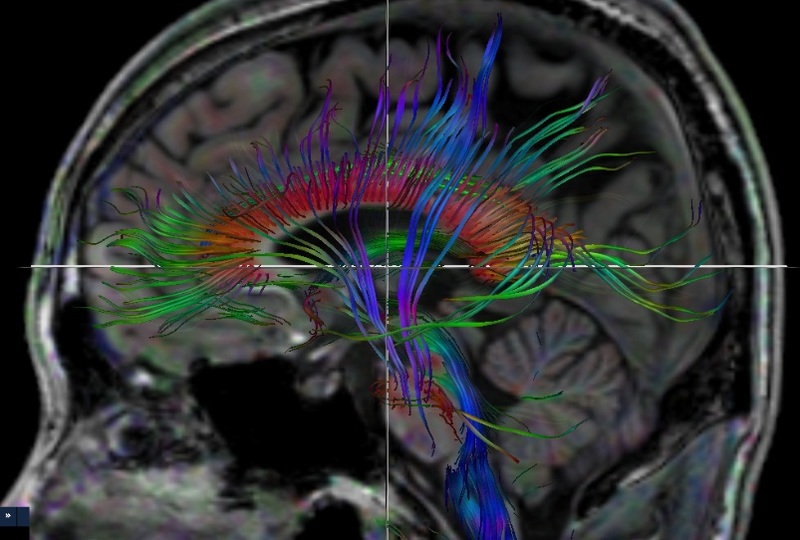 This is an example of nerve fibre tractography using diffusion tensor imaging. Fat-water separation technique allows generating separate images of water and fat from the same animal. The resulting fat images can be used to quantitatively assess fat content in various areas of the body. Images can be acquired from live animals in as little as 6 minutes. This technique can be very useful in obesity research. (First row: High fat diet, second row: normal diet; first column: fat image, second column: water image). Figure "Venogram of the human brain acquired on the UBC MRI Research Centre's 3.0 Tesla scanner". 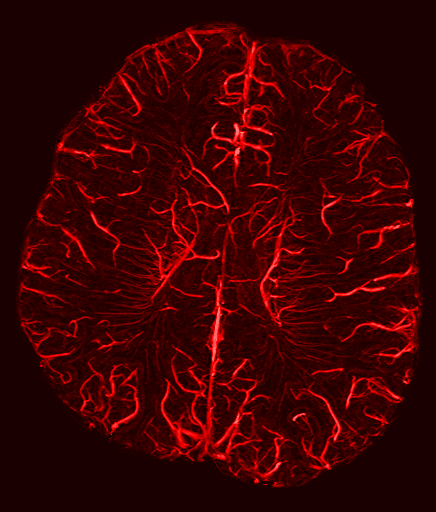 This is an MRI angiogram showing the blood vessels in the brain.